A look back at the first of the leaders' debates, the manifesto launches, Cameron's dodgy stats and the rest of the week's news. • The main story this week was last night’s historic, unprecedented US-style prime ministerial debate on ITV1, watched by a peak audience of 10.3 million viewers and an average of 9.4 million – more than the numbers watching BBC1, BBC2, Channel Four and Five combined. All the pundits, and all the post-debate polls gave the night to Nick Clegg, with opinion divided over who came second. As Left Foot Forward revealed earlier, despite all three national opinion polls – The Times/Populus, The Sun/YouGov and ITV News/ComRes giving Cameron slender advantages over Brown, an overnight poll of Facebook users showed that, of those expressing an opinion, Clegg scored 60 per cent, Brown 21.2 per cent and Cameron 18.9 per cent. Of more welcome news for the prime minister will have been the instant online Sky News poll, which showed Clegg on 37 per cent, Brown on 32 per cent and Cameron on 31 per cent. • Earlier this week, the three main parties unveiled their manifestos, Labour promising “A future fair for all”, the Tories issuing “An invitation to join the government of Britain” (wonder if Mr Grayling got sent one?!) and the Liberal Democrats promising “fair taxes, a fair chance, a fair future and a fair deal”. On Left Foot Forward, we offered a progressive perspective on each, comparing the parties’ pledges to our readers’ manifesto priorities; see how we rated Labour, the Conservatives and the Liberal Democrats. • This week also showed further evidence that David Cameron had failed to truly transform the Conservative Party, with claims a leading light in the young Conservatives was bullied, forced out for being from the north of England, going to a state school, and subject to racist slurs. Also this week, two members defected to Labour over Cameron’s failure to discipline Chris Grayling for his remarks about B&B owners while Tory MEPs joined UKIP and the BNP in voting against a European Parliament resolution calling for women’s equality. There was also renewed evidence, reported by Left Foot Forward’s Rayhan Haque yesterday, of the fiscal irresponsibility of the Tory grassroots, who would rather Cameron pledged himself to cutting taxes than reducing the deficit. 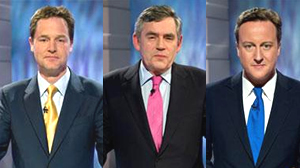 Tory candidates have also declared themselves uncommitted to constitutional reform and climate change. Architect of Labour’s progressive, visionary manifesto Ed Miliband, the climate change and energy secretary. Labour’s manifesto pledged all Whitehall departments would “follow the lead of those who already pay the Living Wage”, prioritised green, low carbon industries, said the party would continue to work to “introduce a global levy on financial services so that banks across the world contribute fairly to the society in which they are based” and pledged to turn British Waterways into a mutually owned co-operative. Among the other radical policies unveiled by Labour was another “200,000 jobs through the Future Jobs Fund, with a job or training place for young people who are out of work for six months … and anyone unemployed for more than two years guaranteed work, but no option of life on benefits”, and widescale constitutional reform, with commitments to referendums on “moving to the Alternative Vote for elections to the House of Commons and to a democratic and accountable Second Chamber”. Tory PPC for Edmonton Andrew Charalambous and Liberal Democrat MP for Hornsey and Wood Green Lynne Featherstone, who sent out inaccurate, scaremongering leaflets in a vain attempt to win votes. The Charalambous leaflet was particularly sickening, depicting a machete specked with blood under the headline “Labour’s cuts” and the false claim that violent crime had risen 44% under Labour. The true figure, not that Charalambous or Chris Grayling would let the facts get in their way, is a 41% fall. Featherstone’s leaflet also featured a ginormous shank and the headline “Labour’s cuts”, together with quotes from Chris Huhne and Nick Clegg, and some Daily Mail-esque hyping up of crime – completely at odds with the liberals’ national message that politicians should not posture on knife crime sentences. David Cameron’s repeated use of selective and thoroughly misleading statistics on cancer death rates, which Left Foot Forward alone has twice this week called him out on. The Tory manifesto (page 44) presented a snapshot showing Britain had the worst cancer death rate (178 deaths per 100,000) of a biased selection – making no mention of the European average, nor the long term trends. Under-65s male and female premature mortality from cancer in England has decreased steadily since Labour came to power, well below the EU average for men and just above it for women. As reported earlier today, according to our friends at Tweetminster (and this will come as no surprise to anyone) the number one topic on Twitter this week was last night’s debate, the spine-tingling anticipation before, the instant flurry of reaction during the debate and the more considered reaction the morning after. To recap, there were a total of 184,396 tweets from 36,483 tweeters at an average frequency of 29.06 tweets per second and a peak of 41.05 tweets/second – with sentiment scores of Clegg 3.631, Cameron 3.033 and Brown 3.006. @bluesun0: #itvdebate: Can we have a Match of the Day-style edited highlights package please, with Hanson and Shearer delivering their verdicts? @wdjstraw: Sky news poll has Clegg 37%, Brown 32%, Cameron 31%. That wasn’t how Murdoch scripted it #itvdebate. Yes, it was an interesting debate. I caught the large majority of it on the radio having gone to a local hustings in my area. Is LFF going to comment on that Sun poll out today? It really is going to be a close election! I also wonder, Shamik, what you make of what the teaching unions did yesterday with regard to SATS? Whatever 1 thinks of them; I happen to be in favour, to boycot now, having prepared children for it all year is I think rather irresponsible.